This summer, a group of nine Hmong students and two Augsburg staff members traveled to Australia as the Global Connections Project. The purpose of their trip was to learn about Hmong social, political, and educational systems in Australia. The group hopes to remain connected with the youth they met while abroad and to continue to build relationships as part of a global community. Second year student, Ka Vang, shared her experience of meeting with Hmong families and community members. This trip to Australia was one that cannot be repeated nor done differently. This experience was such a great learning experience for me personally because it made me aware of how important it is to be Hmong. Being a Hmong American girl and visiting the Hmong Australian families in a group was not expected of me before we started planning. I did not think that it was at all possible to do so. Fortunately, we had a lot of interest in this project and put a lot of commitment into this and made it happen. I am really proud of the girls and our advisors for supporting each other through the process of planning and during the trip. Going to Australia for the first time, I did not really know what to expect but to meet Hmong people. With the little information that we were given from previous speakers and individual research, I was expecting to meet a variety of Hmong families in the different areas that we planned to go. The most valuable experience to my learning were the community gatherings because I was able to connect with the Hmong people in Australia, which was one of the main goals. I was also able to learn from their experiences and share mine as well. Many of the people were also interested in our stories and our lifestyles in the states. 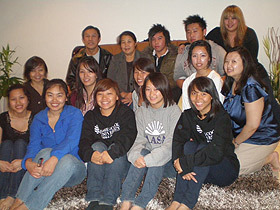 Many of the Hmong parents in Australia are similar to the parents here in the states, whereas there are similarities and differences within the youth. I don't know if it was just me, but I was quite hurt by the fact that a lot of youth are losing interest in the culture and the traditions. Although there are those who are interested in it, they do not have the resources, time, and anyone to teach them. I understand that it is hard to hang on to one's culture and language in a place where you are the minority, but I think it's still very important to keep our culture alive, regardless of where we are. Overall, I am really happy that I was part of this trip because it has made me realize how important my identity is to me. I am just thrilled that the people in Australia and I have so much in common, yet have so much differences. We are the same people, but because we live so far away from each other and in different governments, we form these differences.